This chapter explores the impact of the changing context of Information Technologies (ITs) and Information Systems (ISs) on Teacher Education (TE). ITs and ISs have influenced educational philosophy and classroom practices all over the world. Significant technological innovations over the last three decades have altered the environment in which educators operate and profoundly changed the experience of both formal and informal education. The impact and pervasiveness of ITs and ISs have forced traditional Colleges of Education and University Faculties of Education into a period of transition and transformation. Colleges and Faculties of Education have, for example, become sites of branding and rebranding. The policy makers associated with these programs reflexively look to market-based solutions without first giving serious thought to the challenges preventing the effective integration and use of ITs and ISs in TE, particularly in developing economies. Using a theory-based method of analysis, this chapter gathers and analyzes contemporary views and ideas on education and technology. This chapter finds that the impact of ITs and ISs on TE programs in Nigeria has shortchanged these programs. As a result, education consumers and stakeholders are dissatisfied with the slow integration and use of ITs and ISs in government-owned institutions of higher education in general and in TE programs in particular. The globalization of the education sector and impacts of globalization on the workforce require a different kind of education; one that enhances the ability of learners to access, assess, adopt, and apply knowledge, to think independently, to exercise appropriate judgment, and to collaborate with others to make sense of new circumstances. Much like globalization, emerging technologies have impacted all aspects of national economies and societies. Teacher education has been highly affected by global trends in technology, particularly its economics and business content (Singh & Papa, 2010). Among UNESCO’s recent strategic objectives for improving the quality of higher education are the diversification of content and methods, the promotion of experimentation and innovation, and the diffusion and sharing of information, best practices and policy dialogues (UNESCO, 2002, 2003). Many of these objectives relate directly to information technologies (ITs) and information systems (ISs) which have become critical personal and social tools and have had a revolutionary impact on how we see and love in the world (Ololube, Kpolovie, Amaele, Amanchukwu, & Briggs, 2013). In the context of teacher education, ITs and ISs involve the gathering, processing, storing, distributing and use of information in a range of strategy, management and operational activities with the aim of improving the effectiveness and efficiency of teachers. 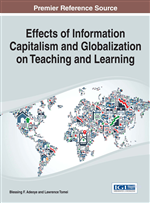 Information capitalism and globalization have likewise impacted the ways in which teaching and learning are carried out in education programs around the world (Singh & Papa, 2010). Innovations in educational technologies are revolutionizing educational design and methodology (Miniaoui & Kaur, 2014). These trends, however, are not widespread and must be further strengthened if they are to reach a large percentage of the population, especially in the third world. In a complex society like Nigeria, many factors affect the use and integration of technologies in the teaching and learning process. As a result, a pro-active, interdisciplinary and integrated approach is required to ensure the successful development of teacher education and, in turn, the successful future development of the national economy (Ololube, 2014). The global academic landscape includes research, teaching and learning. It includes educational programs and courses, the pedagogy or methodology of teaching, the research process (including dissemination and publication), library information systems and services, and administration and management. The integration of IT and ISs in teacher education programs has been the topic of a great deal of debate throughout this landscape. In Nigeria, the relationship between the development of ITs and ISs for teacher education programs and their diffusion into programs in Colleges of Education and university Faculties of Education is dependent upon governmental policies (Ololube, 2011). Information technologies and systems are indispensable and have been accepted as part of the contemporary world especially in industrialized societies. In fact, many have already begun considerable adjustments to meet the challenges and opportunities of the knowledge age. The pervasiveness of ITs/ ISs has brought about rapid changes in technology and attendant social, political, and economic transformations (Ololube, 2006a). The field of education has not gone untouched. Without a doubt, ITs and ISs have impacted the quality and quantity of teaching, learning, and research in teacher education programs globally and to some extent in Nigeria. ITs and ISs provides opportunities for student teachers, and academic and non-academic staff to communicate with one another more effectively during formal and informal teaching and learning (Yusuf, 2005). Consequently, student teachers and academic and non-academic staff now require training not just in basic computer literacy, but also in the use of various communication and educational software packages and applications (Ololube, 2006b).